TSI’s Cincinnati CL-440 laser brings high speed and advanced features to our robust technology ranks. With hardware features including, 12,020 IPM linear magnet motors, low operating cost high performance PRC 4000 watt resonator, simultaneous switching 6.5’x13’ shuttle pallets, linear positional feedback encoders, and single cutting head with 5”, 7.5” and 10” lens draws that is magnetically connected. Software features include Dynamic Power Control, which eliminates cumbersome tech tables while automatically maintaining proper relationship between laser power and instantaneous feed rate, and advanced ProNest nesting suite. 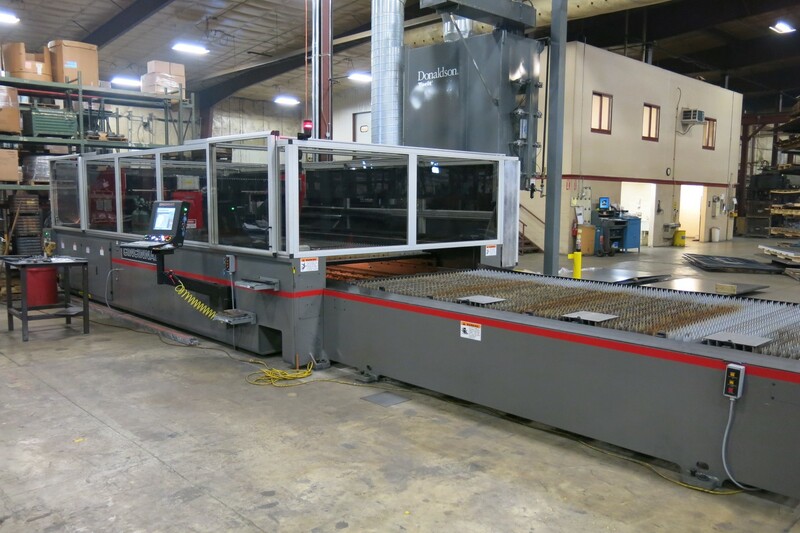 Machine capable of laser cutting 1.00” in mild steel, ½” in stainless steel and ½” in aluminum. TSI utilizes micro bulk liquid oxygen, nitrogen dewars and shop air as assist gases. Laser cutting steel, galvanized, aluminum, stainless steel, wood, polycarbonate/Plexiglas and more. We are a laser cutting job shop capable of high mix processing of small thru large production runs. In house shot blast cleaning and vibratory finishing of laser blanks means your parts are ready plating, painting or direct use by end users. See what our 2D laser cutting can do for you.